This Demonstration illustrates a conjecture of Apoloniusz Tyszka on the set of solutions of a system of linear equations in variables ; the equations are all of the form or for . The conjecture states if such a system has a solution, then there is a solution such that for all . 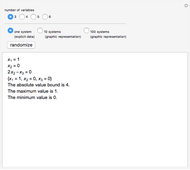 The conjecture is illustrated and tested in several ways depending on the value of the parameters set by the user. 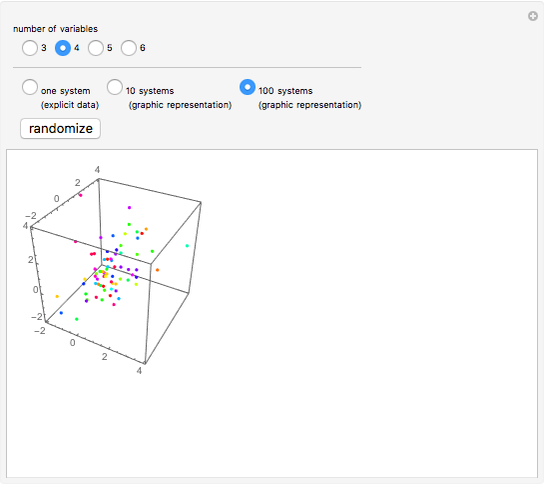 For a given number of variables, the user can choose a single system, which is selected at random. The system and its unique solution are then displayed in an explicit (textual) form. 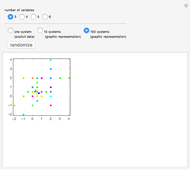 If the number of systems is larger than one, then the output is displayed graphically in a form that depends on the specified number of variables. For three and four variables a sample of the actual solutions is displayed inside a rectangle or a rectangular box (we omit the first coordinate as it is always 1). 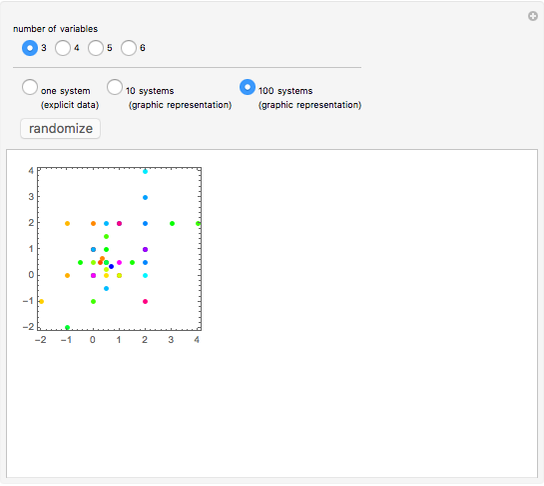 For five and six variables the specified number of systems is created at random and the maximal and minimal values from the solution sets are plotted on two bar charts. Let be a natural number and denote the set of equations . A conjecture of Apoloniusz Tyszka states that any consistent system has a solution consisting of rationals belonging to . Each consistent system of this kind can be enlarged to a system with a unique solution. This Demonstration considers these enlarged systems. For , there are only 48 solutions, so they are computed and displayed. If you choose 100 systems, there will therefore be no change when you click the randomize button. For , the total number of solutions is still small enough to be computed (confirming the conjecture in this case) but too large to be displayed. 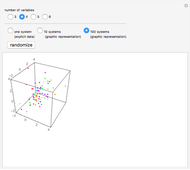 Thus the solutions are computed deterministically but a randomly chosen sample is shown. 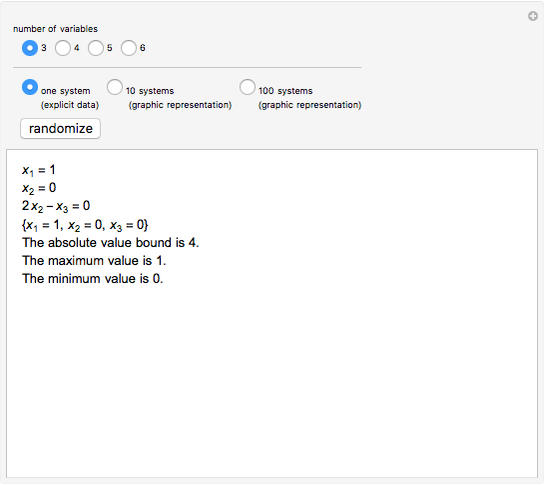 For and , the number of solutions is too large to compute so a random collection of systems is chosen and their maximal and minimal values are displayed on bar charts. always has the solution , containing a number of the maximal conjectured size. Reference: A. Tyszka, "Some Conjectures on Addition and Multiplication of Complex (Real) Numbers," arXiv:0807.3010. Apoloniusz Tyszka (Hugo Kollataj University, Krakow) "A Conjecture of Apoloniusz Tyszka on the Addition of Rational Numbers"